They're obviously not the same size as the car's wheels, but you get the idea. Kids born with silver spoons in their mouths have another reason to feel fortunate about having deep-pocketed parents as Mercedes is launching a fancy baby stroller. Developed by German company Hartan in collaboration with the automaker's design department, the Avantgarde replicates the five-twin-spoke design of AMG wheels finished in black and white as you'll find them on the C-Class. There's more to the baby stroller than its car-derived wheels as it has been fitted with air-chamber tires and even an adjustable suspension making it easy to maneuver. The low weight also helps, with the aluminum frame tipping the scales at just 19.6 pounds (8.9 kilograms) while the seat unit weighs only 9 lbs (4.1 kg). Proudly carrying the three-pointed star on the seat unit and the "Mercedes-Benz" lettering on the frame, the Avantgarde baby stroller boasts all the features you'd come to expect from a high-end product, including an infant carrier used in the first few months of the baby's life. It's extremely light and can be mounted on the frame with just one click. Further contributing to the baby stroller's functionality are additional features like the telescopic handlebar and parking brake, as well as a height-adjustable footrest to guarantee maximum comfort for your little one. Whether you want the kid to face the direction of movement or to look at you, the seat unit can be turned 180 degrees on the frame with just one click. 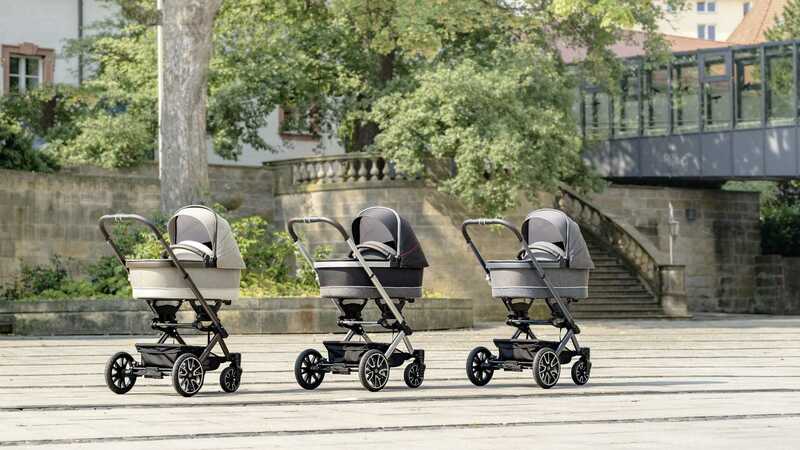 The baby stroller will go on sale next month and is going to come bundled with an assortment of extras, such as a sunshade umbrella "in a stylish Mercedes-Benz design" and a wind shield for the seat unit. In addition, there's also an organizer for your mobile phone, keys, and wallet, while a rain hood is also part of the package. Mercedes and Hartan will also throw in a footmuff, which will come in handy if you're living in colder climates.